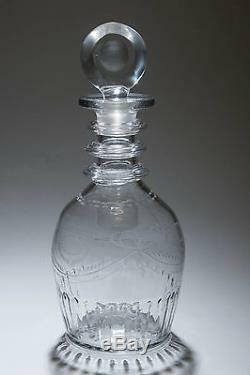 An early 19th century Irish mould blown decanter. The base is mould marked with the Waterloo Co Cork mark, which is quite difficult to make out, this normally occurred as the mould wore over time making the text less crisp. The pontil inside the mark has been partially ground and polished. 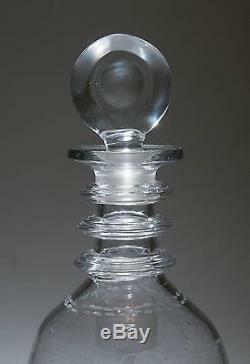 The decanter is not a full sized example and is approx a 2/3rds design. The lower section of the decater has mould blown ribs. Above the body is etched with a bow and sunflower design which is quite typically Irish in design. There are three neck rings and a wide pouring lip. 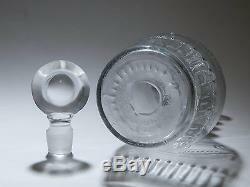 It is fitted with a bullseye stopper which is not original and appears to be a custom made replacement. Cork mark difficult to make out due to mould wear. Age related wear around the body with some scuffs and scratches. Lots of wear to the base. Stopper clearly a replacement, but of good fit. If for any reason you are unhappy with your item please let us know as soon as possible, and we will do our best to put things right. 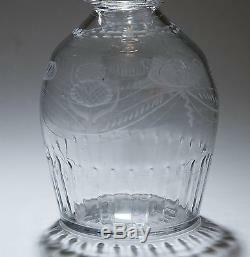 The item "Antique Waterloo Co Cork Marked Irish Mould Blown Glass Decanter Georgian c1820" is in sale since Friday, February 13, 2015. This item is in the category "Pottery, Porcelain & Glass\Glass\Date-Lined Glass\Pre-1840". The seller is "chrisbuckman" and is located in Lincoln. This item can be shipped worldwide.